Yes, I have already blogged about this book. But it’s worthy of two mentions, if not more. Shilpi Ramkinkar Alapchari or In Conversation with Artist Ramkinkar ranks as one of the best books I have read in the last five years. The author, Somendranath Bandopadhyay sure knows how to bring conversations alive on the printed page. For, not one among the series of dialogues this book features reads like a well-structured interview or stiff intellectual discourse. The tone of the book, in itself conversational and informal, makes the animated interaction between the two principal voices even more life-like. The book’s most overpowering element is the close, personal, and honest view of Ramkinkar, the man. Here is a barber’s son, coming from a financially humble background, pulled by the charm of idol-making in his village, who reaches the zenith of India’s art horizon. This ascension is only a fraction of Ramkinkar, though. What makes it so remarkable is his complete obliviousness to the fame and recognition he achieves. The book presents layer after layer of this lovable artist completely shorn of materialistic or pride-geared ambitions, rooted to the soil for all his life, not overwhelmed while receiving honor, and unfazed in the face of the most shattering despair. I saw a simple man, who never considered himself any special when the whole world revered him as a genius. A man who felt the closest to the people of the earth—the santhal tribal folks—whom he loved and respected from the core of his being for their simplicity, hard working nature and joyful living. I saw an artist so innocent and unadorned that he cared naught for the ways of the civilized world. The same ways he sometimes found so uncomfortable to deal with he calls the people displaying those as “the ones that sound so out-of-tune. “ I also saw a man pulsating with the rhythm of life, radiating warmth, and uninhibited when laughing out loud. Although a book doesn’t carry sound, the power of this one’s words helped me imagine Ramkinkar’s thunderous laughter. Another day’s story. At the counter of Vishwabharati’s central office. (Kinkarda has) come to the cash section to withdraw his salary. While handing out the pay, the counter colleague politely informs Kinkarda that this would be his last salary packet. Kinkarda is stunned. He says, “Why, why is that?” “You retired a month ago. So…” Hearing that Kinkarda falls off the sky, “What are you saying, what will I eat then? So you won’t give me pay next month?” “No, sir,” the counter official informs awkwardly. This man is strange. His anxiety and its release are both worth watching. His mind is detached from all things material. The fists are loose. In those loose fists he’s only held art all his life. As endearing as it is to see the sculptor’s personality, it’s still not a full view. Without knowing Ramkinkar the artist, the full depth of his inner self isn’t fathomable. Again, the author brings this part of Ramkinkar Baij in all its glory. The conversations mostly hover around the artist’s works and the author’s keen understanding of them. We get deep into the mind and heart of a creator, learning how each of his works came into being—both mentally and organically. Someone who has no artistic acumen, the discussions on Ramkinkar’s finest creations fascinated me with every nuance leading to their origin. To learn that the figure of Sujata, the woman who had served milk rice pudding to Buddha, had actually been inspired by a lanky student at Shantiniketan was not a let down, but a revelation. Especially when one learned the associated story of how the famous Nandalal Bose, Ramkinkar’s mastermoshai at Shantiniketan, advised putting a bowl on top of the woman’s head, transforming her into Sujata. In Conversation…mentions how even Tagore acknowledged Ramkinkar’s genius. One day, the poet summoned the young artist to his room. When the latter answered the call, frightened and nervous, Tagore said to him, “So, will you be able to fill this entire campus with your works?” Probably the greatest prize Ramkinkar received (and he did receive some prestigious awards). While reading the book I lamented not being born early enough to see this humane, child-like, genius of a sculptor. 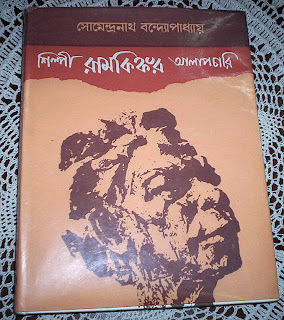 But I am glad Somendranath Bandopadhyay preserved his essence so lovingly for me to cherish. Sounds like an interesting book. Is it published in America? Hi Paul, Thanks for dropping by. :)No, the book hasn’t been published in America. It’s written in Bengali and has been published by a major Calcutta-based publishing house. The author is looking to get the book translated, though. It looks like an interesting book, and you sure make it sound good. You’ll have to let us know if they publish a translation. It is a wonderful book, Oni. No doubt I will let you know if/when the translated version is out.